The larger of the breed is known as a Standard Dachshund. They are the big brother of the miniature dachshund, some have described them as little Napoleons, they will take on anything. They are solid little dogs, that were mainly bred for hunting badgers and foxes as a strong heavier build of dog was needed, but now so many people love them as pets. More about this amazing big,little dog. Chest measurement over 14 inches - used to assess size in Germany and some other countries. Measurements are as at maturity ( 12 months old ) and may vary from country to country. Just like the miniature the standard comes in three coats, Short hair called "Smooth", Long hair and Wire hair, each has a personality of their own. The original dachshund breed was the smooth coat. 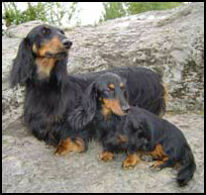 The longhair and wirehair coats came later with selective breeding. 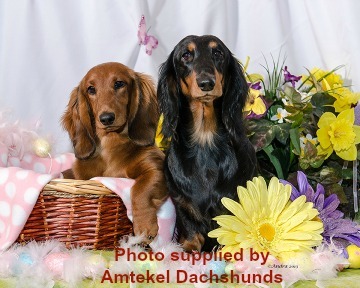 Here are two lovely black and tan long haired dachshunds, this gives you some idea of the size difference between the standard and miniature. The dachshund has a long compact body, very strong short legs, confident head carriage and intelligent facial expression. Their clean cut tapered head with finely formed muzzle and black nose with open nostrils sets off the almond-shaped expressive eyes, the hound ears are set near the top of the head. Front paws are compact with 5 arched toes including dewclaws which are not used, they have tough pads and strong nails. The hind paws are smaller that the front paws dewclaws. Back dewclaws should be removed if they are floppy or getting caught. The long body is well muscled, with a deep, broad, strong front and the tail is long and tapered making an excellent handle for pulling the dachshund out of a tunnel.Strength and power are one of the main attributes of this larger size dachshund. 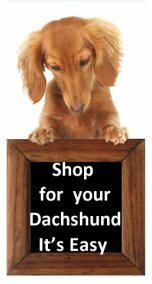 Now some owners of standard doxies, love working and competing with their dachshunds in earth dog trials, dog agility events, or in dog field trials. These are all very addictive sports and the standard doxie can excel at these events. Some people just prefer the standard dachshund, as they are the big dog of the breed, I believe they are more than just a dog. Visit our Standard Dachshund Breeders if you think this is the doxie for you.